In 2009 we visited Nepal and met up with my friend Sushil. He took us to his parents house up in the hills and we met them and his wife. This was a very special and memorable experience. 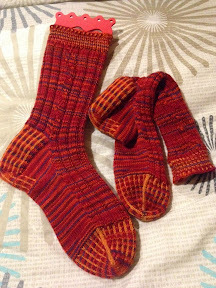 I posted (from Nepal) a pair of hand knitted socks for his mother. They never arrived. It was disappointing but not exactly surprising. Now I have another pair for her. I will post them and make a special prayer to the god of travelling socks to help them to their destination on the other side of the planet at the country at The Top of The World. 12 Sept 2014 Sushil sent me an email to say they had arrived... So post from NZ to Nepal does get through.